How should Christians think about their relationship with politics as American culture moves away from certain moral Christian principles? When should pastors address politics? How do we help our members share the Lord’s Supper with people who voted differently in the last election? 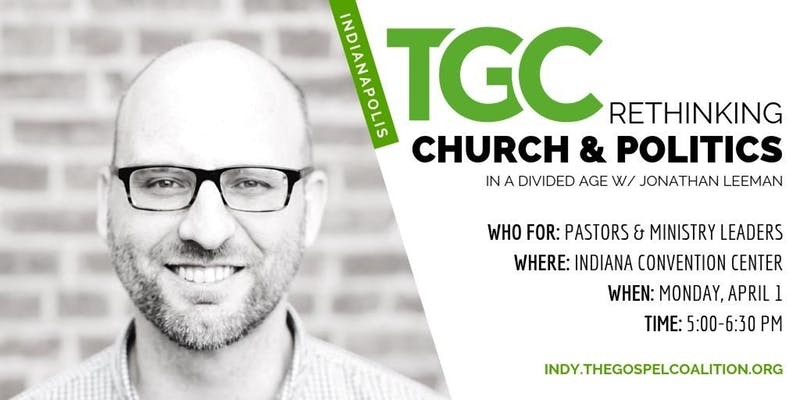 Join TGC Indy for a time of learning and Q&A during the TGC National Conference with Jonathan Leeman, author of How The Nations Rage: Rethinking Faith and Politics in a Divided Age. Jonathan Leeman (Ph.D, Wales) serves as editorial director for 9Marks. He has written a number of books and articles and edits the 9Marks Journal and series of books. He also serves as an elder at the Capitol Hill Baptist Church in Washington, DC.